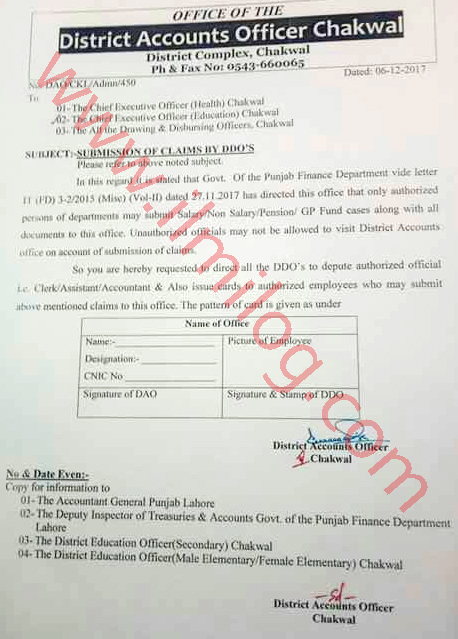 A letter is issued by the office of District Accounts office Chakwal dated 06-12-2017 about Issue Cards for Salary and Wages Claims in District Account office Govt of Punjab Finance Department. Subject: Submission of claims by DDOs. Please refer to the subject noted above. In this regard, it is stated that Govt. 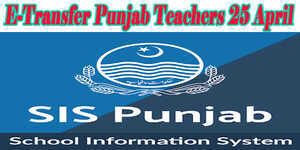 of the Punjab Finance Department vide letter No. FD.3-2-2015(Misc)Vol-II dated 27-11-2017 has directed this office that authorized persons or department may submit Salary/ Non Salary /Pension/GP Fund cases along with all documents to this office. Illegal officials may not be allowable to visit district accounts office on the explanation of obedience claims. Thus you are hereby directed to everyone the DDOs to allocate authorized bureaucrat (clerk, Assistant accountant) and also question cards to authorized employees who may submit above-mentioned claims to this office.